boychuk fienhage foligno gauthier-leduc henley kassian matt mackenzie mcnabb pysyk shipley sundher sutch Aaaaand....they're off! The zambonis are tuned up, new sticks have been ordered, and the billets have cleared space. With QMJHL camps breaking ice and the rest of the CHL starting to follow suit, so begins another season of SabresProspects coverage. Aside from going to LA for the draft, hitting up prospect camp for a few days, doing early prep for the 2011 draft, and lending a hand to Puck Daddy, it was pretty mellow summer hockey-wise. All of a sudden I'm eager for games that count and glad to be able to provide your daily fix on the happenings of the future Buffalo Sabres. Things are looking good for the current batch of hopefuls. Not that size always matters, but they're seemingly bigger than ever with many in good positions to succeed. We're going to try some new things this season, but before that let's take a brief east-west cruise through CHL training camps. As usual, the Q was the first to get things going with their mid-August camp dates. The Sabres will have just two prospects skating in the league this season, down from their usual four, as some of their recent mindshare has shifted towards the WHL. One of the more offensive-minded blueliners in the stable and currently the youngest Sabres prospect, Kris Letang Jerome Gauthier-Leduc will continue his development with the Rimouski Oceanic in 2010-11. The 'Nics broke the seal on August 18th and two days later dropped the puck with Baie-Comeau for a four-game exhibition series. JGL appeared in three of the four outings, finishing +3 with an insurance goal in a 6-4 win on August 20th. He skated even the following night as the Oceanic defeated the Drakkar, 6-2. The 6'1 defenseman posted a -1 with four shots on goal and three blocks to close the series with a 3-1 loss on Saturday. Rimouski will continue their pre-season on Thursday against Bathurst. Cedrick Henley, the Sabres sixth rounder in June, returns to the Val-d'Or Foreurs looking take a dramatic step forward after notching 31 points over his first two Q seasons. After sitting out the Foreurs first two exhibition contests, the 6'5 wing scored the opening goal in their 6-1 defeat of Rouyn-Noranda on August 22nd. Henley was given the night off in Saturday's 3-2 loss to the Huskies. The upcoming week will see four forwards, including three aggressive grinders and a developing playmaker, reporting for duty in what should be a wide-open season in the "O". Fresh on the heels of a strong showing in Team Canada's U20 Evaluation Camp, Zack Kassian and now re-building Windsor Spitfires will open camp on Tuesday, August 31st. For now, the back-to-back Memorial Cup champs look to have thrown in the towel in their quest for a third by trading Justin Shugg and Marc Cantin to 2011 hosts Mississauga earlier in the week. Windsor may have as many as nine OHL rookies on their roster this season, putting Kassian under the offensive microscope from the get-go. At this point, let's hope Kass embraces the role as the Sabres want his all-around game to keep spiking. The Spits their exhibition schedule with a Labor Day matinee with Plymouth. Recently turned 19-year old Marcus Foligno will head to Sudbury Wolves training camp on Spetember 2nd to begin his first OHL season without his father Mike behind the Wolves bench. Foligno is likely to again skate alongside center John McFarland (FLA) at some point this season, but with new faces dotting the Wolves roster comes the possibility of Foligno starting as the #2 center. Much of that will shake out beginning September 10th when the Wolves open the pre-season against Barrie. Sutch, the Sabres fifth round pick in June, will enter the Majors camp with a clean slate after an injury riddled draft 18-year old season. The 6'2, 193-pound banger has shown the propensity to do damage on the forecheck and with his fists, and will no doubt be eager to get his season on track beginning with the first team's first pre-season game Sunday, September 5th versus the Rouyn-Noranda Huskies of the QMJHL. Steven Shipley will return to Owen Sound for his third OHL season when the Attack open main camp on Monday. The 6'2, 200-pounder went from 39 to 63 points over his first two seasons, and should show another healthy increase in 2010-11 as he uses his size and heavy skating stride to take the puck to the net. The Attack kick off the pre-season with a home-and-home versus Barrie on September 5th and 6th before engaging Sutch and Majors on the 12th. For the first time since 1999-2000, the Sabres will have a six-pack of prospects brewing in the "Dub" providing this ESTer with plenty of late-night viewing options this season. 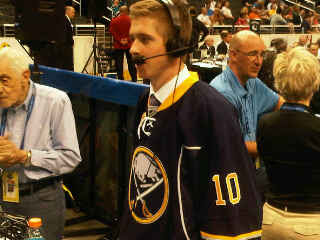 Mark Pysyk speaks to the media after being selected 23rd overall. The Sabres top pick in the June draft, Mark Pysyk reported to Edmonton on Saturday for fitness testing and the start of the Oil Kings training camp. The team will hit the ice on Monday in prep for their exhibition opener on September 5th against Medicine Hat. Pysyk is carrying the momentum of his Team Canada U20 camp showing into the season, where his excellence in special teams will be relied upon as main catalyst to the Oil Kings success in 2010-11. With a simple and steady fall, Pysyk has as good a shot as any to make Team Canada come winter. Fellow Team Canada invitee, 6'4 Brayden McNabb will return to Kootenay as one of the league's top rearguards. The sixth leading scorer among WHL defenseman last season and fourth in team scoring with 57 points, McNabb's hard work at both ends should position himself near the top of the Hockey Canada's radar for December. With plenty of good tools in place, the Ice will open the pre-season at the Tri-City Tournament on September 10th against Seattle. As far as Sabres training camp goes, I fully expect the hard-worker to earn a pre-season game before going back to Kootenay. Corey Fienhage began his WHL career on Thursday when he checked in for Kamloops Blazers training camp. The two seasons in the University North Dakota's program, including use of the supreme facilities at Ralph Englestad Arena, should greatly benefit 2008 third rounder in his transition to the Dub. Big and rugged in his newly measured 6'4, 220 pound frame, the 20-year old Fienhage has the athleticism and ripping shot to be leveraged by the Blazers in various situations nightly. For those who tracked Nick Crawford and the Barrie Colts last season, think of Fienhage as a Dalton Prout type - a big, physical righty anchoring the 2nd pair. Kamloops opens the exhibition schedule on September 3rd against Kevin Sundher and the Chilliwack Bruins. The experienced Sundher is expected to man the top-line pivot for the Bruins this season after scoring 25-goals and 61 points in his second WHL campaign in 2009-10. The Surrey, B.C. native is a prospect that wasn't invited to to Canada's summer evaluation camp but could very well get land at their Selection Camp in December if he and Ryan Howse (CAL) can heat up quickly. Regardless, he's already a prime candidate for for next season's U20's. Solid two-way defenseman Matt MacKenzie willl look to build on his Memorial Cup experience when the Calgary Hitmen open main camp on September 3rd. Entering his fourth season on the WHL circuit, MacKenzie will be counted on for big things in both leadership and point production as the Hitmen graduated a slew of talented players from last season's squad. The club opens the exhibition season with games against Red Deer on the 8th and Medicine Hat on the 14th. Power forward Riley Boychuk, 19, and the Portland Winterhawks opened camp this week as a serious contender for the WHL title. With injuries behind him and Portland brimming with talent, the right situation could see the hulking 6'5, 220-pounder double his 2009-10 line of 14-16-30 and realize the potential that made him a top-bantam draft pick a few years back. The 'Hawks will make their preseason debut on September 3rd against Seattle. I'm going to get my money's worth with the WHL this season. It's where the action is. I expect Fienhage to establish himself early on as an aggressive crease clearer. He's big and tough and will be ready to take on that role. He should have a strong season for the Blazers. I noticed his shot over the summer as something that is raw but powerful. He needs to keep it lower. I really think McNabb makes Team Canada. He battled hard last season to return from a knee injury in under of month just to get back in time for the Can/Russia series and an opportunity to impress. He's already close to AHL quality in my opinion, so a healthy McNabb could be a dominant one this season. Matt MacKenzie is set to have a great year as well. I'm not sure if he can top last year's point total, but you're going to see a smart, team-first guy who will show up every night.